The Newbold Edgar residence in Southampton with landscaping by Clarence Fowler. The house sits at 309 South Main Street. There may also be colorized pictures of the gardens. Can't seem to find them. I have to lecture at a donor's luncheon at College of the Atlantic in a couple of hours. I was fairly pleased with my subject--sort of Down Easton Abbey, with tales of Servants behaving badly--until I read Ancient's last link. Any stories I had to tell pale by comparison. "(The NYC Police Department used to be a little different.)" Yes, and vividly costumed gentlemen can still be counted upon to decorate the streets of NYC. To this day, in fact. "(Another old view of the house.)" A better link. Click to enlarge. It's very similar. But if it's the same house, the protruding gable on the front behind the entry porch would have to have been removed, the chimney on the northeast wing somehow lost, and the old house behind it in the second picture I linked torn down. All that's possible, I suppose. I can't get that page to load. Wrong Newbold. 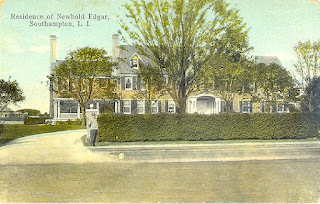 This was Newbold and Agnes Edgar's house, not Newbold Leroy and Marie (Manice) Edgar's house. They were cousins. It's an easy mistake. Yes, the house still exists at 309 South Main Street.